Every few months we see news of the latest ingredient. Coconut oil is the latest, greatest ingredient all over the news…But how do you know it is the right or even safest ingredient for YOU? Manufacturer’s need to sell their product. They hire great marketing agencies to tout their development… one they have invested a lot of time and money on. But there is a sometimes a gap between the market hype and consumer’s best choice. Here’s my insider scoop on this latest craze. There are two general types of product companies. Those who develop blends of ingredients targeted to solve different problems. They may use one set of ingredients for skin rejuvenation and a completely different set for acne. There are also those who base their products around a single KEY ingredient. This varies with current “hot trends.” Right now coconut oil is one of those ingredients. But is coconut oil right for you? 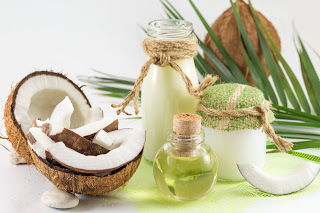 Coconut oil is a tropical oil from the nut of a palm tree. Check the jar of coconut oil in your cupboard. It’s not liquid but solid at room temperature. For those with problem skins…this is a yellow flag. In the 1960s tests ingredients testing established which ones tended to cause breakouts. Based on results they were assigned a ranking from zero – no risk, to 5, high risk. These test results became the gold standard for all products produced since. Coconut oil rated a 4 out of 5 meaning it has a high risk of causing clogging. It is full of fatty acids which oxidize on the skin gluing dead cells to the surface and slowing or clogging oil excretion from the follicles. If you are using a product with coconut oil in it and noticing more breakouts…it’s probably your product. It may be time for a change – quickly. If an oil like this is only on your skin temporarily, as in a makeup remover, you may not have an issue. The longer it’s in contact with the skin, the higher the risk of a problem. People who use comedogenic oils as a hair conditioner should keep an eye on their scalp or hairline for breakouts it could trigger. Sometimes even people who normally don’t have blemishes can have a response to a clogging ingredient. Bleached, dry, color-treated or weather-damaged hair may love the fatty acids in coconut oil conditioner. If you have fine, thin, dry, or sensitive skin, you may not have any issues. It’s not that coconut oil is a bad ingredient…it’s learning what ingredients are best for your skin. Acneic skins might find a product with jojoba oil a better choice. Jojoba is an ingredient that doesn’t solidify at room temperature. Its comedogenicity rating is zero. It actually has the ability to emulsify sebum so helps acne clients purge follicles rather than be something that aggravates their skin. So when the next…newest and greatest ingredient shows up in marketing…save yourself some money. Before you buy…investigate the ingredient first to see how it might work with your skin. If you need help trying to sort through all the products on the market and their hype…speak to a trained qualified esthetician who has taken the advanced classes to help you make smart decisions.